Layout and Navigation controls that simplify mobile UI layouts, and give you a variety of ways to present and navigate content. Familiar controls like accordion, stack, list, menu, and tabbed view are all supported, alongside a wide range of other controls. Adaptive page layouts automatically adjust to different classes of devices, from desktops and tablets, to smartphones, so you can design pages that are automatically optimized for different form factors. Media Output controls that support multimedia playback, adaptively leveraging HTML5 embedded audio and video tags where supported. Native controls that provide access to device features like the camera and microphone. These controls work in conjunction with the ICEmobile Containers to provide cross-platform hybrid capabilities right from your web applications. The Universal Mobile Web Controls automatically adapt to the clients accessing them, delivering device-specific styling and optimized markup for each supported device type. Central to this is a device detection and rendering mechanism that serves the appropriated CSS resources, and optimizes the markup of each control to match the capabilities and idiosyncrasies of each device type. 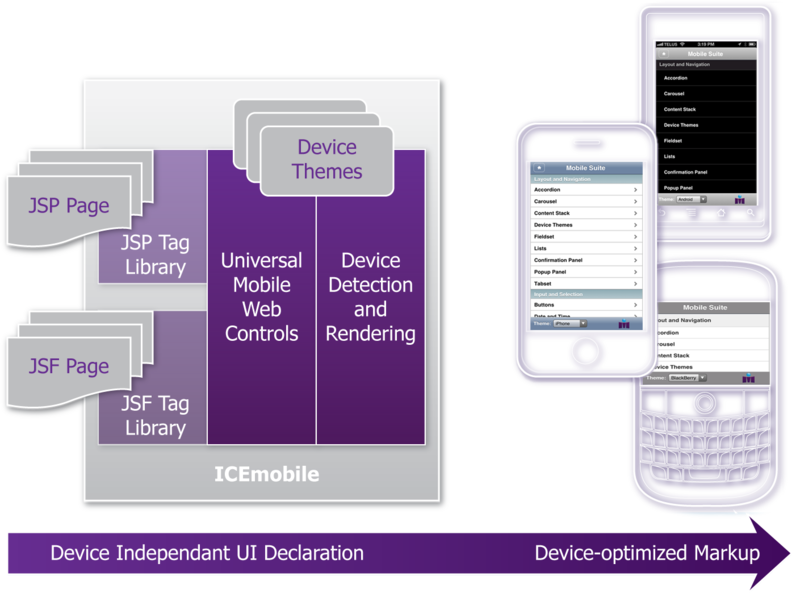 As illustrated below, you write a single, device-independent page declaration in either JSP or JSF, and ICEmobile transforms that into optimized, device-specific markup and styling. The Universal Mobile Web Controls use ThemeRoller-complient CSS themes, and ICEmobile provides default themes that match the native look of all supported platforms. You can use these themes as provided, or you can customize them using the ThemeRoller tools to align with your own branding. Check out all the Universal Mobile Web Controls in action in the ICEmobile demos.